We talk with Josh Wattles of deviantArt about the soical netowrkng site and its new collection of photos now available through Fotolia. Josh Wattles brings a unique and learned perspective to the world of photography in his role as Advisor in Chief to deviantART. Josh has a distinguished career as a lawyer, executive and academic. Josh headed up a staff of 60 lawyers at Paramount Pictures. As a senior intellectual property lawyer for Paramount Communications, Josh advised Paramount on film, book publishing, sports and cable television matters, and was a key player in the music industry’s anti-piracy programs. He helped to create the industry’s collective licensing organization for cable and satellite retransmissions of television programs and films in the EU. Josh has also been an in-house litigator for the American Society of Composers Authors and Publishers (ASCAP), and at Paramount he ran all of its music operations, including the production of numerous award-winning multi-platinum soundtracks and management of its significant music publishing interests: The Famous Music Publishing Companies. Josh was the founding president of Mixonic.com, an active online CD and DVD replication company, and he created and developed both the strategy and technology for Xingtone. Josh’s private clients have in addition to motion picture studios; music companies and new media properties have included the World Monuments Fund, Dorothy Hamill, Televisa, and J.K. Rowling. Josh is a professor in copyright law at Southwestern University Law School and at Loyola Law School in Los Angeles. He is a former president of the Los Angeles Copyright Society. Josh, so you were headed into a photography career and ended up as Chief Advisor to one of the most visited sites on the Internet. Can you give us a brief history of how you originally got into photography and your journey to where you are now? At 15 I started as an intern and then as an assistant for fashion photographers in Manhattan. This was in the ‘60’s. I got some good jobs shooting reportage and thought I should work instead of going to college. A mentor at the time told me to get educated. I did and after a period as a fine artist went on to law school. I wanted to practice “art law.” I feel like some 30 or so years later I finally ended up where I thought I was headed. Your title is “Advisor in Chief”. What kind of advice does a Chief Advisor give…and to whom? I advise the deviantART on legal and business matters including strategy and execution. I am available to everyone on the staff and a surprising number of them take advantage of having me around. Some actually listen to the advice and few might even follow it from time to time. DeviantART, is reported to have over 18.5 million members, nearly 200 million submissions, and gets over 140,000 new submissions per day. DeviantART users upload over 1.4 million "favorites" and 1.5 million comments every day! The domain deviantart.com pulls in something like 50 million unique visitors monthly. It is the largest social networking art site in the world. That all seems overwhelming to me. How on earth does someone get a handle on all of that…I mean, you couldn’t see all the art in a lifetime even if you dedicated your whole life to it! For those wishing to dive into deviantART, where do you begin? How should one approach it? The way deviantART reaches those numbers is in aggregating thousands of interest groups each of which may be quite small. But in your area, photography, we have millions of members who identify themselves as working in that medium. DeviantART is a community set around a grouping of tools that allows them to interact and share their work with like-minded folks. The beauty in that is that they get their own handles around each other. Our job as staff is to make sure the tools are working correctly. I come from the world of commercial photography where earning money is a primary concern. In the deviantART world how important is earning money? Some members of the site are working artists, some are collectors and fans, some are amateurs – we really have every kind on the platform all of whom use it in very different ways and for different reasons. There are photographers soliciting and obtaining work off of the site and there are art directors using the site to find photographers. There are others who use it for creative feedback. Some use the site for inspiration on how to handle their next assignment or to take advantage of the thousands of tutorials. All of these relate to earning money. But the primary focus is on a community of support for the art that you produce or that you enjoy. I see that there are several moneymaking ventures available on deviantART including prints sales and T-shirts. Is there money to be made through those and other deviantART offerings? T-shirts are made by deviantART and sold as deviantART merchandise. Any member of the site can offer their work in the form of prints that we can manufacture for them and ship worldwide. Premium members of the site can also set their own prices and royalties for the prints. 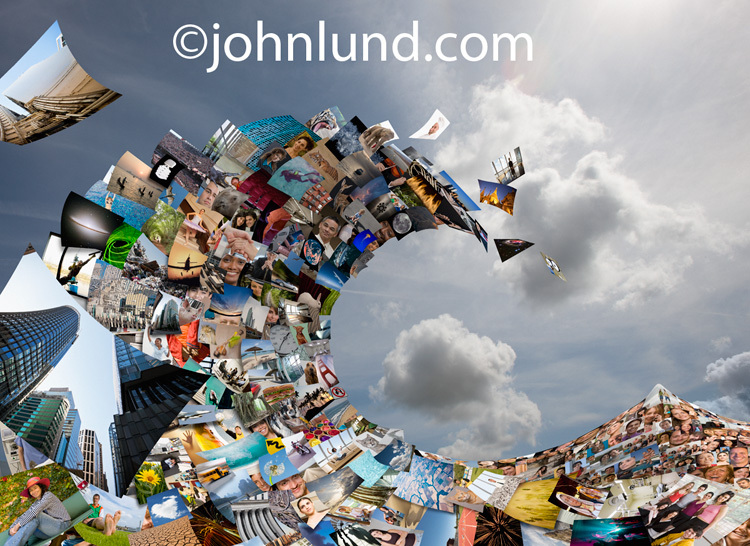 DeviantArt is now moving into the world of commercial stock photography with a micro offering through Fotolia. What took so long? Actually, there is vast amount of stock photography, images, brushes and digital materials already available on deviantART and shared by the members. This has been true since the beginning. Thousands of photographers on deviantART participate in other web-based stock offerings like Fotolia, iStockPhoto, and so forth. DeviantART itself is not moving into stock photography as a business. The deviantART Collection by Fotolia http://www.fotolia.com/dacollection was created for the benefit of our members, and Fotolia has been a great partner in this because they are completely dedicated to the stock business. We do think that users will be attracted to the deviantART brand in the context of a formal stock offering. The images in the collection are quirky, more leaning towards editorial use and artistic in intent rather than illustrative. Is the deviantART community showing much interest in this new stock photo project? Those who are in the collection are absolutely delighted and others are following its progress. It is still very early to tell how we are doing and to decide how we will expand the collection to include many more participants. What does deviantART bring to stock photography that isn’t found elsewhere? We hope to bring an overarching attitude and aesthetic in the images that get distributed under the brand. It is hard to place in words what deviantART’s collection “looks like” because it deviates from the norm. That’s what the name deviantART means. What are deviantART’s plans, if any, for expanding further into the world of stock photography? This first venture was an experiment between both parties involved (deviantART and Fotolia) and the success of this collection will be a large part of the decision making process. At this point it’s too early to tell what direction we would take, although the initial uptake is very promising. I have been pretty heavily involved in the professional photography world for over thirty years, yet deviantART has barely been on my radar. Does deviantART have something to offer professional photographers? The core value of deviantART to professionals is audience. And this audience is comprised of art-centric viewers who are happy to provide constructive critique. To give you an example: I had a one-man show of photographic works at a strong gallery in San Franciso several years’ back. If you discount the people there more for the drinks and less for the art, at the opening party, my work was seen by maybe 200 interested people. If I sold a monograph through a real publisher, maybe I could move 4,000 copies and it would be a big hit. Now compare that to deviantART, where in two years my work has been seen more than 180,000 times and I am not a particularly popular artist on the site. I believe that the biggest challenge facing photographers today is getting their work seen. From your perspective what are the challenges that face artists in general and photographers in particular, and how can deviantART help with those challenges? Getting your work seen has never been an automatic proposition and it isn’t on deviantART either. But the social tools provided on deviantART are very useful for building audience. Within a short time you can find compatible members who in turn provide exposure to other members. You can use the Groups system to find affinity groups for particular genres and types of work. Then the members of those groups will expand the audience further. People can share links to your work on other social networks. Professionals have an obligation to get themselves out there. Connection with an audience is an end goal because you can never tell who sits in the audience and what they will contribute to the advancement of your work. No other site provides access to an audience interested in art on its own. Photographers on deviantART gain adjacency to other works of art and to artists in over 2,500 categories and media. That expanse and the opportunities it presents for growth and exploration are simply not available elsewhere. DeviantART like any social environment requires that you apply yourself within the social circle. You need to reach out to people. But the value is that the people are there 24/7. It’s never an empty space. It is always populated. The deviantART stock offering is being billed as a truly unique collection yet is being priced at the microstock level. Has deviantART considered a higher price point? Is there a possibility of a higher priced collection in the future? Will deviantART be offering stock collections through other distributors? Certainly not in the near term. Fotolia has proven itself. It is the only stock company out there that genuinely understands deviantART and that is committed to our unique blend of community and commerce. Does deviantART have plans for a similar motion or video offering? It is still early with the deviantART collection on Fotolia, but do you have indications yet on how it is performing? It is doing quite well but we will not be releasing public numbers. Is a similar project for illustration a possibility? Certainly a possibility and an excellent proposition; but not a current priority. You have quite a strong background in the music industry. Has that background given you any insights into how photographers, and other artists, might be able to weather the threats of online copyright infringements, plummeting prices and image inundation? While you mention three big challenges to the photography business, we should also keep in mind that the use of photographic content has exploded with the Internet and the Web. Among other things, online businesses have produced a multi-billion grossing micro stock industry. I hope the next major step for monetizing photography will be streams of visual content delivered to screen displays at both commercial locations and to the home. It would be like a form of visual radio broadcast. This is quite different than television where the viewer is essentially forced to attend. Like radio, visual streams would occur in the foreground or the background depending on what the consumer pays attention to and would be “dialed-in” to a type and style of visual stream that the user is interested in for the moment. Just like ASCAP and BMI for music, collective organizations could monitor image uses, collect licensing fees and distribute royalties to artists. The cost of a 24” x 36” digital display is now the equivalent of a single photograph in the same size by a middle level photographer in a well-made custom frame. Is there much of a problem on the deviantART site with people claiming others work as their own? How is that policed? DeviantART has a very robust copyright policy. It takes down infringing content when properly requested. Since the community is made up of co-creators presenting their own work, we are policed by the community with a level of attention that’s pretty intense. In addition, there is a culture of mutual respect at work among peers. This is quite different than other sites that aggregate content just for the sake of the aggregation. Josh, do you have a favorite image or your own work, and the story behind it that you can share with us? I have found that looking at an artist’s “favorites” gallery on deviantART frequently says more about their worldview, taste, philosophy, attitude and state of mind than looking at the artist’s own work. When someone chooses your work as a “favorite” you get a notice sent to you in your internal messaging center on deviantART to that effect. You can then see how your work is being considered by its adjacency to other choices and preferences of the viewer. This kind of feedback loop is gold in terms of gaining an understanding of how your work is perceived by others. Josh, what have I forgotten to ask, or what else would you like to share with us? You can’t ask a professor a question like that without risking an endless boring lecture. Haha. great interview like always, but really selling stuff like this for microstock-prices won't work for the artist, it's a good promotion for Fotolia though.But from the photographer/artist side it's a stupid thing to do. I use Go Daddy...and yes, it IS fast!